Here are some of my favorite quotes about the Trinity which I used today in my grad class analyzing the dogma. . .
“There is no subject where error is more dangerous, research more laborious, and discovery more fruitful than the oneness of the Trinity (unitas Trinitatis) of the Father, the Son, and the Holy Spirit” (De Trinitate, 1.3.5.). 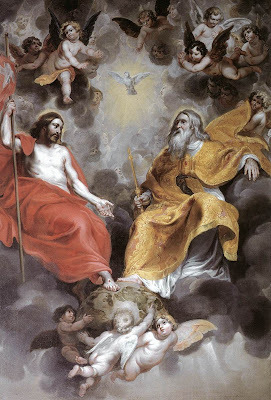 "The mystery of the Most Holy Trinity is the central mystery of Christian faith and life. It is the mystery of God in himself. It is therefore the source of all the other mysteries of faith, the light that enlightens them. It is the most fundamental and essential teaching in the "hierarchy of the truths of faith" [GCD 43.]. The whole history of salvation is identical with the history of the way and the means by which the one true God, Father, Son and Holy Spirit, reveals himself to men "and reconciles and unites with himself those who turn away from sin" [GCD 47]" (CCC 234)." Cited in Giles Emery, Trinity in Aquinas (Ypsilanti, Mich.: Sapientia Press, 2003), 1. Betrand de Margerie, The Christian Trinity in History (Studies in Historical Theology; trans. E. J. Fortman; Petersham, Mass. : St. Bede’s Publications, 1982), xvii. Matthias Scheeben, Mysteries of Christianity (trans. C. Vollert; St. Louis: B. Herder Book, Co., 1946 [1865/1888]), 25. Great stuff! I'd love to be able to take that class. What's your reading list look like? On a side note, do you know if there's a significant difference between Emery's Trinity in Aquinas and his more recent book The Trinitarian Theology of St. Thomas Aquinas? I have the latter and he begins the introduction with the same quotation from Augustine. Dr. Barber, you are amazing. You taught that class all day and you still have the pep to write a blog post!